The U.K.-founded company, positioned as a next generation real estate agent, is hoping to replicate the success of its Australian rollout. Onboard Informatics, the leader in real estate information, is helping power the newest portal shaking up the industry, Purplebricks. The U.K.-quoted Company launched their concept in Los Angeles in September with plans to expand across California in the coming months and throughout North America. Purplebricks offers a unique experience for both sides of the real estate transaction. For home sellers, the company charges a flat fee of $3,200 to list a property. In a high-priced housing market like LA, this has the potential to save sellers thousands of dollars in traditional sell-side commissions. 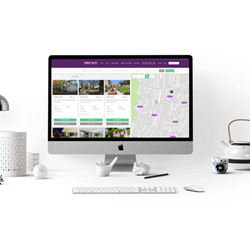 Home buyers can view all properties and agents in one place on the Purplebricks portal. In addition to search, buyers can submit offers in real time, negotiate sales on properties and communicate directly with all relevant parties. Purplebricks utilizes the developer platform from Onboard Informatics to access neighborhood and property information on the site. London-based Purplebricks is three years old and recently raised $60 million in a special stock offering to launch in the U.S. Its innovative model for real estate has proven successful and includes services such as professional photography, immersive 3D virtual fly-throughs, the ability to schedule home tours 24/7 as well as an innovative platform that enables buyers and sellers to converse safely and securely, make offers and have them accepted, in real time, day or night, listing for a flat fee on the sell side. Traditionally, home sellers are charged a percentage on the sale of their home. Purplebricks is challenging the traditional commission-based transaction model using tools like the robust API’s from Onboard Informatics, offering customers a much more transparent solution. Purplebricks, the next generation brokerage will continue to communicate the strength of its consumer-centric value proposition to customers across Los Angeles as it expands its combination of technology, full service local agents, and fair flat fee ‘sell-side’ approach.